In 1928, American poet Carl Sandburg was fifty years old and consumed by the most taxing work of his life. Nearly a decade after Chicago Poems (1916) established him as the voice of the Midwest, Sandburg began two more projects that earned him his reputation as one of America’s foremost historians, an expert on the American way of life as seen by “the people.” Enamored with Abraham Lincoln, Sandburg eventually became one of his primary biographers, and it was during this busy period of the 1920s when Sandburg began the first volume of the president’s life, Abraham Lincoln: The Prairie Years (1926). Though that book alone was a cumbersome task, Sandburg also agreed during this time to compile the American Songbag (1928), a collection of nearly 300 scores of American folk music. A musician in his own right—Sandburg was known for his plucky guitar stylings and distinctive baritone voice—as well as an established chronicler of history, Sandburg seemed the natural choice to write this book, though the project would plunge him deep into research. These encyclopedic works exhausted Sandburg, who, in 1927, relocated his family and home to the tranquil dunes of the Chikaming Township near Harbert, Michigan after a nervous breakdown left him bedridden, doubting the progress of his work. In the midst of this, Sandburg was still writing poetry. During April of 1927 he came to UVa and visited the editor of VQR, James Southall Wilson. Wilson commissioned poetry from Sandburg during this meeting and later wrote to him in June 1927 to follow up, perhaps to remind the preoccupied poet to send his pieces. “You were good enough when you were here to suggest that you would send some of your poetry to the Virginia Quarterly Review,” writes Wilson. Then, regarding payment, he defers wholly to the famous poet: “We pay usually fifty cents a line (an absurd but usual practice) but should try to meet whatever are your usual rates.” Putting business aside, Wilson also mentions in this letter Sandburg’s “pleasant” visit with writer James Branch Cabell in Richmond during his tour of Virginia, which Wilson heard about from Mrs. Cabell—the central Virginia literati grapevine. There is no available reply from Sandburg, but his poems were sent within a year after his initial meeting with Wilson, who published the poems in VQR in the July and October issues of 1928. The original manuscripts of the seven poems Sandburg sent all still exist. After seeing the pages for each issue, Carl Sandburg wrote to VQR twice in 1928, pleased with his publication in the magazine. In these letters, Sandburg’s words crackle with his typical candid style: he fits genuine sentiments into lines so terse that they nearly sound flip, though they are likely just the result of his undoubtedly large pile of correspondence to maintain. Mostly, these letters reveal Sandburg’s affection for Wilson’s work and VQR as a publication. 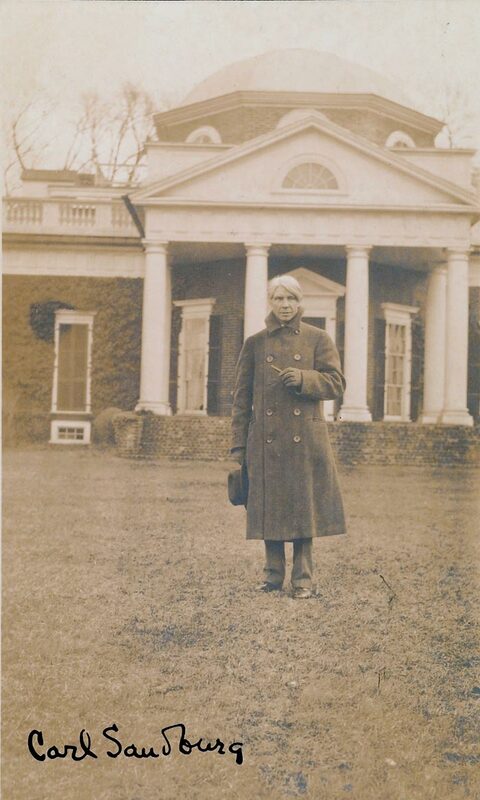 In 1929, Sandburg changed paths and become solely invested in his catalog of Lincoln’s life. He worked toward the publication of the second volume, Abraham Lincoln: The War Years (1939). 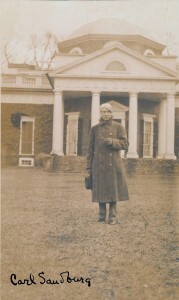 His study of Lincoln’s wartime ideology led to Sandburg’s outspoken support of the Allies in World War II and the US’s decision to enter the war. His poetry during this era, represented in The People, Yes (1936), also took on a more overt activist leaning. He began a novel, Remembrance Rock (1948), which tops the list, along with War and Peace, of the longest books of fiction ever written. Taxed once again with epic works, Sandburg retired to Flat Rock, North Carolina, where he and his wife Paula expanded their goat farm. “Just now I am a little hard-driven,” he would later write in 1945, “but possibly next year in my portfolio you may find something worth printing.” This would be his last communication with VQR. Sandburg, in the sunset of his career, was receiving some 200–400 letters a week, and was understandably weary. Still, his short letters carried the same jovial, personal tone as when he once wrote to Wilson. This candid intimacy, present in even the most mundane of business letters, is the same quality that made Sandburg popular as a poet and as a historian. For the sincerity and understanding he brought to his subjects—the people in America’s present and past—Sandburg stands as a writer whose greatest gift may have been his ability to relate to others. Works used: Niven, Penelope. Carl Sandburg: A biography. New York: Charles Scribner’s Sons, 1991. Manuscripts are from Papers of the Virginia Quarterly Review, 1925-1935, Special Collections Department, University of Virginia Library.